A few years ago, I came up with “The Seven Biggest Mistakes that Entrepreneurs Make and How to Avoid Them” for a breakfast seminar presentation. 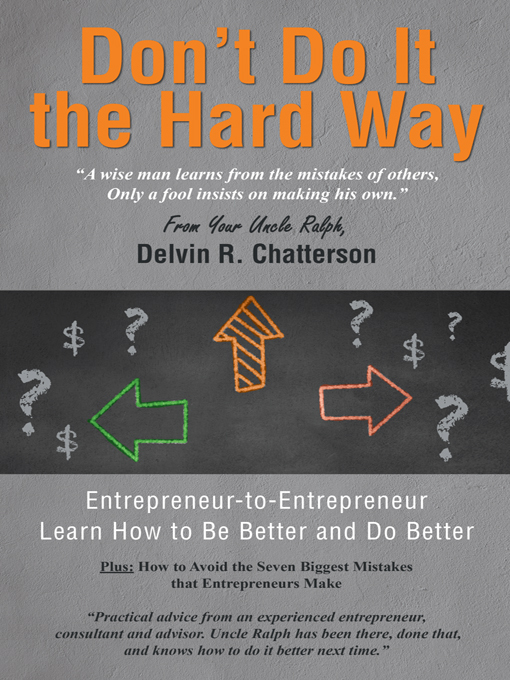 The presentation was well received and has since been used many times, eventually expanding into several chapters of my latest book for entrepreneurs, “Don’t Do It the Hard Way”. This is a short version of my list of the seven biggest mistakes followed by my recommendations to avoid them by seeking balance. Certain characteristics of entrepreneurs are necessary for them to be successful. But if over-indulged they can lead to big mistakes. These include the tendency to be too opportunistic and not sufficiently selective and focused; to be too optimistic and miss or ignore the warning signs; to be too impatient and expect too much too soon. Entrepreneurs usually have great confidence in their instincts, but the mistake is to neglect or ignore market feedback and analysis of the facts. Being action-oriented, the tendency is to “just do it”. Entrepreneurs are expected to be decisive and demonstrate leadership, but both can be overdone – deciding too quickly and providing too much direction so that input, initiative and creativity are stifled. 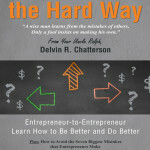 All these mistakes can arise from being “too entrepreneurial”. Another tendency of many entrepreneurs is to get lost in the daily details and completely forget their original strategic plan. Operating decisions demand continuous attention and there is seldom time dedicated to stepping back and looking at the business from a strategic perspective. The common observation is that the owner is too busy working in his business to effectively work on his business. Defaulting to continuous short-term decision-making can result in the business not having consistent strategic direction and straying far from the original plan. Lack of strategic direction may be the single Biggest Mistake that Entrepreneurs Make. Another common mistake that can have devastating consequences on the business is the over-confident entrepreneur who concludes, “That was easy, let’s do it again!” So he or she jumps into new markets, new product lines, or even a new business or investment opportunity without doing the homework first. It’s important to remember: Making money doesn’t make you smart. Look at every opportunity with the same detached analysis as the first time you started a business. Many successful entrepreneurs have made the mistake of jumping into a new venture – merger, acquisition, restaurant franchise or real estate investment – and blown away the equity value they generated in their original business. Another big mistake to avoid. A focus on short-term profits will do exactly the opposite. It is easy to improve short-term profit by reducing the maintenance and marketing expenses, neglecting product development, cutting employee wages and benefits, ignoring safety and environmental regulations and avoiding taxes, but these actions can all destroy long-term value. Paying attention to these requirements will help to build it. Managers need to look at all their key performance variables and react quickly to avoid big mistakes. The key relationship for any business is the one between management and staff. Good communications are essential to providing strategic leadership and ensuring that management and staff are working effectively as a team toward common goals. Sometimes we are distracted from our key relationships by the most annoying and challenging employee or customer. Often your biggest customers are not the “squeakiest”; just the most important. And do you need to squeak more yourself? Do your suppliers appreciate you enough? Another important relationship is with your banker: Is your bank a welcome and willing partner in your business? Building and protecting these key relationships are essential to keeping your business on track and meeting your strategic objectives. There are usually obvious signs of poor marketing and sales management. Feedback from customers will also highlight your failures in customer service. Opportunities for growth are being missed and current customers are fading away. No business can survive without effective marketing and sales management supported by consistent customer service. All three functions need to be done well to build loyal, long-term profitable customer relationships. Personal issues can seriously affect business performance regardless of whether they come from the owner, management or staff. Family businesses introduce particular challenges to managing personalities and corporate culture. Can you include family members in the management team without excluding others? Each of these Big Mistakes is a result of the entrepreneur failing to achieve balance between opposing forces. Balance Personal Priorities with Strategic Objectives. Balance these issues to grow and prosper in your business and avoid the Seven Biggest Mistakes that Entrepreneurs Make. Enjoy the Holiday Season and have an outstanding New Year.